In a moment, I am going to show you a photo of some ice cream. The ice cream is white and it kind of looks like vanilla. Actually if it were homemade vanilla, at least the way I make it, there would be black flecks in it from the vanilla bean. 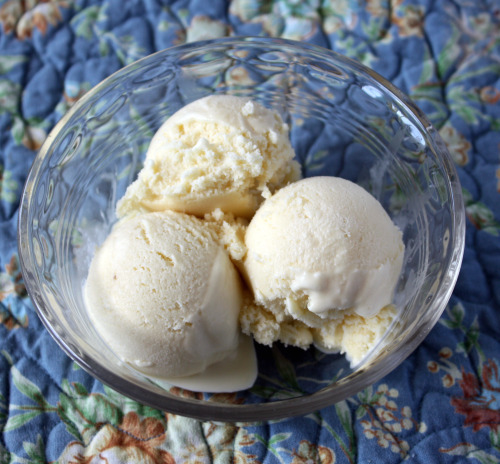 So, the ice cream I am going to show you looks even more vanilla than vanilla – if you catch my drift. This is my garden. I posted about it in May and, as you can see if you compare the photos, it has exploded. Our study, where I do all my writing and emailing, faces this garden. As I gaze out the window in January, it seems impossible that plants will every bloom again. Everything is cut back and looks completely dead. But then, right on schedule this happens. Back to the ice cream. You see those plants up there? Lavender. 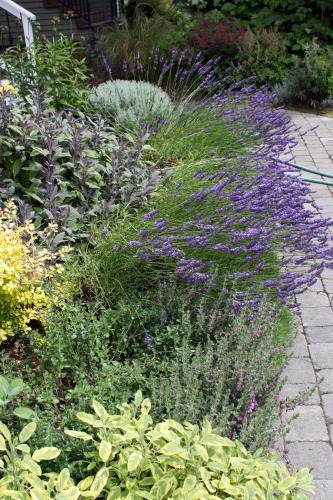 As you walk up to our front steps, you get a tremendous whiff of lavender. I used to think I didn’t like the scent. I still don’t if you are talking about a perfume, an essential oil, or a sachet. But fresh is something else all together. At the risk of sounding like one big cliché, I first smelled fresh lavender in Provence. On our way home, after our year in London, we spent a week at a special little villa with some friends. 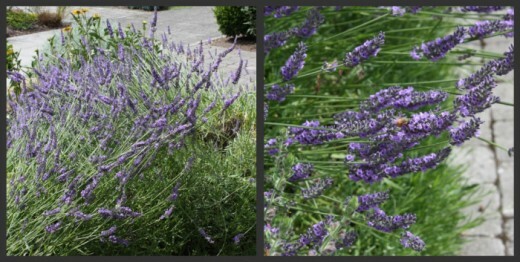 The English couple who owned the villa harvested the lavender and left it out to dry around the property. It was there that I learned that the scent of those purple flowers is much more delicate and much sweeter than the potpourri in a bad B&B would leave you to believe. Still, lavender in ice cream? When I told my brother I had made Lavender-Honey Ice Cream, he immediately yelled, “Soap!”. But no. It tastes of cream and honey with just the slightest and most subtle floral undertone – and I mean that in the most flattering way possible. This is actually the second time I have made this flavor and the first time Randy told me it was the best ice cream he had ever eaten. Randy is not a big food person but he loves ice cream. He loves it enough that if I said I couldn’t live without one of those $500 ice cream makers which take up a tremendous amount of room but don’t require the bowl to be frozen for 24 hours before using it, he’d probably run right out and buy me one. But then I would be making ice cream constantly so it’s probably best that I stick with my $50 Krups model. In my head this is also known as the ice cream that almost burned my house down. The first time I made it, I was steeping the honey with the lavender. This is accomplished by putting the honey and lavender flowers in a small pot, bringing the heat up so the honey is hot, and then turning off the heat and allowing the flavors to meld together. Right as I turned the heat on under the burner, I got a phone call. I ran into the study to check something on the computer while still on the phone and proceeded to forget about the honey. I also forgot that I had left a rubber spatula (heat resistant to 650ºF!) in the pot and by the time I smelled my error, the entire pot was burned (my one quart! ), the spatula was non-existent and there was smoke throughout the house. Just as I ran upstairs to try and furiously fan the smoke away from the detectors so my boys wouldn’t wake up, alarms all over the house went off. This is a long story. All I’m really trying to say is – don’t walk away from the honey. Heat the honey and 2 tablespoons of the lavender in a small saucepan. Once warm, remove from the heat and set aside to steep at room temperature for 1 hour. Warm the milk, sugar, and salt in a medium saucepan. Pour the cream in a large bowl and set a mesh strainer on top. Pour the lavender-infused honey into the cream through the strainer, pressing on the lavender flowers to extract as much flavor as possible, then discard the lavender and set the strainer back over the cream. Stir the mixture constantly over medium heat with a heatproof spatula, scraping the bottom as you stir, until the mixture thickens and coats the spatula. Pour the custard through the strainer and stir it into the cream. Add the remaining 2 tablespoons lavender flowers and stir until cool over an ice bath. Chill the mixture overnight in the refrigerator. The next day, before churning, strain the mixture, again pressing on the lavender flower to extract their flavor. 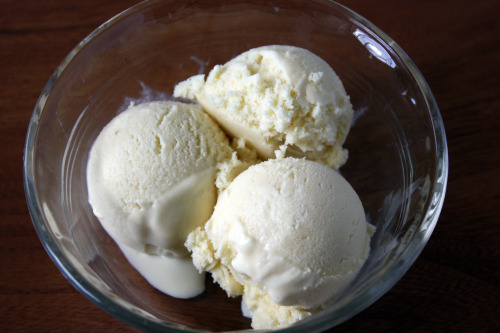 Discard the flowers, the freeze the mixture in your ice cream maker according to the manufacturer’s instructions. Sounds fresh and delicious! I’ll be right over for a scoop! This sounds perfect on a day like today…it’s pretty warm here outside of SF. Your brother’s response brought a smile to my face…funny. And I think you’re smart to note that a good flavored honey is important. I’ve learned recently with some baking I’ve been doing with honey that not all honey is created equal. Thanks for another great recipe, Dana! I planted a lavender plant in a pot with a few other good smelling pretty cooking things (2 types of mint and Thai basil). The lavender is the smallest plant and I don’t know if I’ll ever get to use it to cook. This ice cream sounds so great. I have a whole book I received on cooking with lavender. Everything looks great. I am always so very wary of flowers in food for just the reason your brother mentioned…and also because of a bad experience I had with coconut bubble tea that tasted like sunscreen. But I trust you. And I have culinary lavender sitting here. And a Cuisinart ice cream maker that needs to go in my freezer. So I will definitely be trying this. 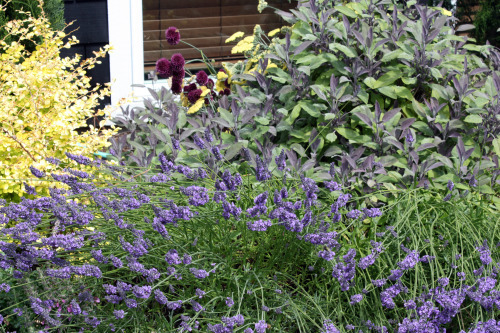 Love the variegated sage and the globe thistle? 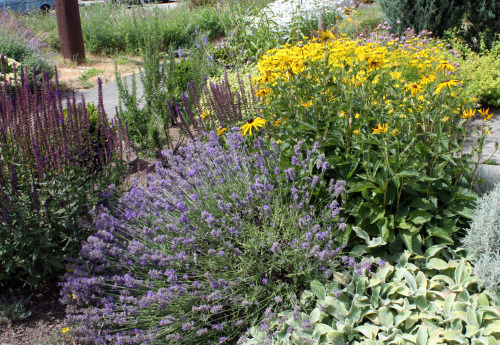 Very similar to our NJ perennial garden. Lovely! Yummy to the ice cream! Your garden is beautiful and this ice cream sounds heavenly. It sounds like just the recipe to try here in the midwest where it is so hot and humid. Thanks for the doubly lovely post. Lavender is a flavor I’m slowly coming around to enjoying. It actually grows really well here, and I have some in a big pot. I’m going to have to try this ice cream! Lavender ice cream has been on my to do list to make! It sounds intriguing but I’ve never tried this ice cream recipe! I can’t wait to try it – especially since I saw your wonderful pics and it sounds like it may even taste okay! Yikes!!! I’m happy to hear that you didn’t burn your house down. Before we had an electric kettle, I used to boil water on the stove. But I would always forget about it so I ended up ruining the kettle and a pot or two. Eventually I got an electric kettle, and I try to set the timer in the kitchen so I don’t forget about things now. I loooove the sound of this ice cream and you have a completely gorgeous garden! I’ve always wanted to make lavender pound cake, though I’ve never eaten it, it just sounds so good. I’m sure it tastes great. I love lavender ! I make myself lavender herbal tea. Ice cream with lavender and honey…divine. How do you prepare the lavender to use in food?? I want to try this… I love Lavender gum! your garden is so, so lovely, dana. happy birthday! hope all your wishes come true. xo. Lavender is my favorite herb, and this ice cream sounds amazing! Happy Birthday, too!